8. 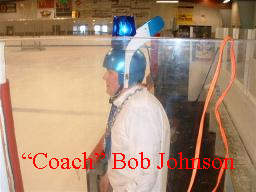 Curtis Nelson (Goalie), Attended Goalie Camps w/Zach, Freshman at Kasson Mantorville HS. 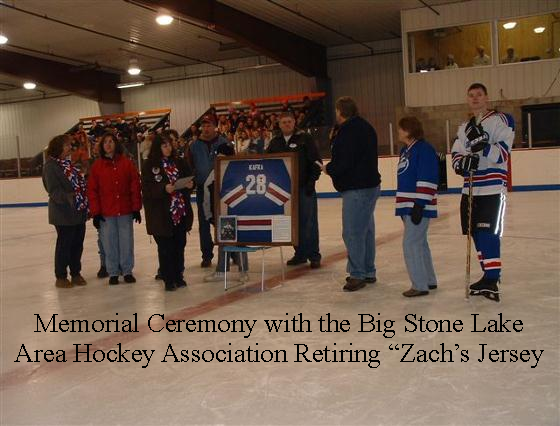 A crowd of over 200 people got to see Big Stone Lake Area hockey at it’s finest on Saturday in Morris for the Zach Kafka Memorial Hockey Day. The bleachers were full, both teams had a full bench of players, coaching was animated, outstanding goaltending, plenty of scoring, a 5-man shoot out, a game that ended in a tie and settled when Jimmie Laub scored the winning goal for the “Oldies” Team in sudden death overtime. 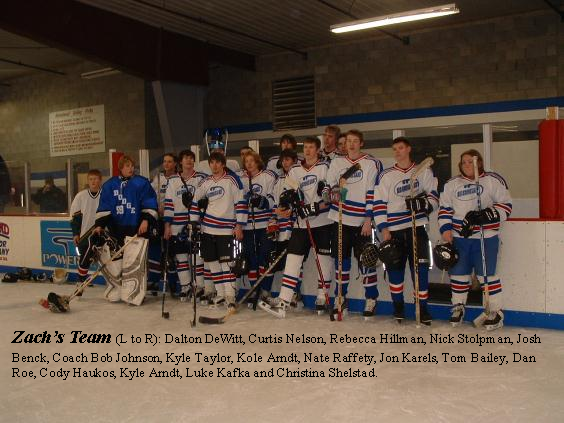 The game presented goalies, Steve Raffety in the net for the “Oldies” and High School Freshman Curtis Nelson from Kasson, MN in the net for “Zach Team”. In the end the “Oldies” came out on top with a score of 9-8. 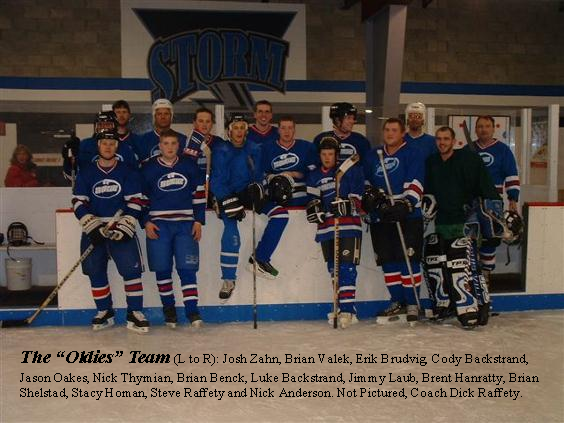 Scoring for the “Oldies” Team were, Brian Shelstad with 4 goals, including one goal in the shoot-out, Paul Tinklenberg with 1 goal and an assist, Stacy Homan, Jason Oakes, Nick Thymian, all with one goal and Jimmie Laub scoring the game winning goal in sudden death overtime. For Zach Team, Josh Benck had a hand in every goal scored during regulation play. Josh scored a Hat Trick (3 goals) and had 4 assists. Nick Stolpman scored 1 goal and 2 assists. Cody Haukos scored 1 goal and 2 assists, Nate Raffety scored 2 goals, and Kole Arndt scored the only goal in the shoot-out for Zach’s Team. The Kafka family would like to express their deep appreciation for the support that was shown and the interest in the game. Without the help of the Big Stone Lake Area Hockey Assn and the Morris Area Hockey Assn this day would not have become a realty. Thank you to Bonnie Sue Stolpman for singing the National Anthem, John Stolpman for announcing the game and keeping the game stats, Gene Benck for running the game clock and music, Patty Haukos for taping the game, Sue Stolpman for registering players and accepting donations at the door, and Alex Sandhurst (Zach’s Cousin) for his help during the pre-game ceremonies. Thanks to both the Mites and Mini-Mites form Big Stone and Morris for providing our pre-game warm up. And a special thank you to the fans who came out to support Zach’s Dream and enjoy an outstanding day of hockey. 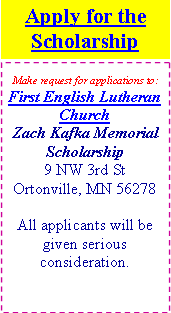 Nearly $2,000 was raised for the Zach Kafka Memorial Scholarship fund.